Amongst the fauna thriving in the subterranean spaces below the surface of the earth's crust, the insect-like diplurans and, precisely, those in the campodeid family are one of the best-known groups, currently comprising almost 150 species. However, not a single subterranean member of the family had been known from Japan until very recently. As part of a project at the National Council of Technological and Scientific Development, the research team of Dr. Rodrigo Lopes Ferreira, Universidade Federal de Lavras, Brasil, and Dr. Kazunori Yoshizawa, Hokkaido University, Japan, conducted an expedition to a total of 11 carbonate caves in the southern Japanese islands of Kyushu and Shikoku. Out of these, they managed to collect dipluran specimens from three touristic sites and sent them to Dr. Alberto Sendra from the Research group in Soil Biology and Subterranean Ecosystems at Alcala University, Spain, for identification. 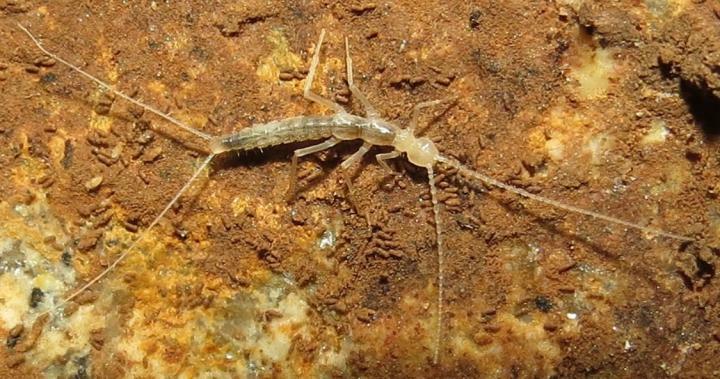 To the amazement of the scientists, it turned out that they had collected specimens of two previously unrecognised species of well-adapted subterranean campodeid diplurans. Moreover, one of the new species (Pacificampa daidarabotchi), identified exclusively from the Mejiro-do cave located near an active quarry in Kyushu, proved to be the largest known dipluran in the family Campodeidae. Measuring about 10 mm in length, the creature looks gigantic next to any other campodeid, which, most often, are only half as big. Inspired by the peculiar size of the former, the researchers decided to name it after the giant yökai creature Daidarabotchi, known from Japanese mythology. According to one of the legends, Daidarabotchi once lifted up the mountains of Fuji and Tsukuba in order to weigh them. By accident, he split the peak of Tsukuba in the process. Another remarkable finding from the same study is that the genus, where both new species were assigned – Pacificampa – serves as yet another example of the former physical connection between Asia and America some millennia ago. In their paper, the scientists note that the genus demonstrates close affinities with a genus known from North America. "We hope that this discovery could stop the destruction of the land nearby and preserve for the future the subterranean habitat of these remarkable gigantic species," say the researchers in conclusion. Last year, lead author Dr. Alberto Sendra and his colleagues Prof. Boris Sket, University of Ljubljana, and Prof. Pavel Stoev, National Museum of Natural History, Bulgaria, described another fascinating cave-dwelling campodeid dipluran. Discovered in Eastern Turkmenistan, the species, whose name (Turkmenocampa mirabilis) refers to its wondrous peculiarity, was the first of in the order of Diplura found in Central Asia. Further, it was the first strictly subterranean terrestrial creature recorded in the country.